Having the chance to read and review the stunningly charming children's book: Minette's Feast by Susanna Reich was a complete thrill for me. I was ecstatic when I won the book on a give-away that one of my favorite blogs, A Tonk's Tail...(err, Tale) had a few months ago. 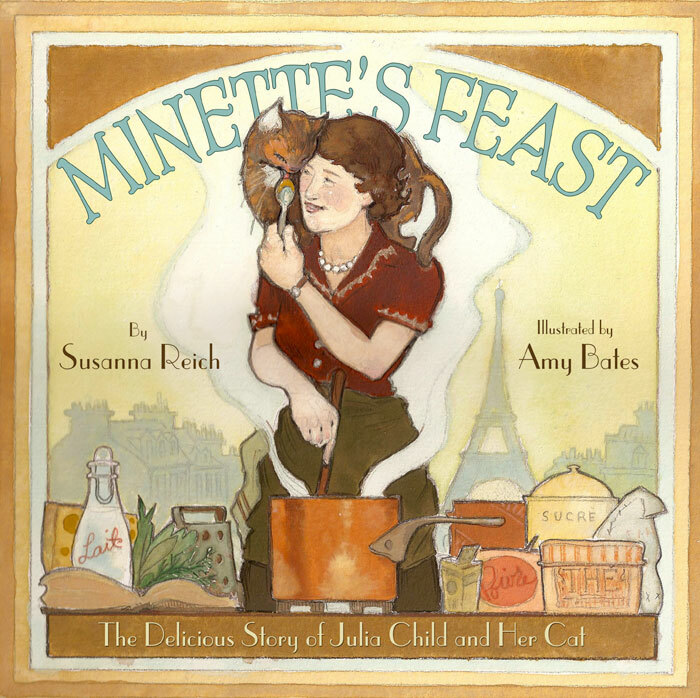 Minette's Feast is the story of a cat that was adopted by legendary chef Julia Child while she was living in Paris. Julie & Julia that made me go "Hmmm..." and planted the seed which would lead to the birth of Cat Chat. 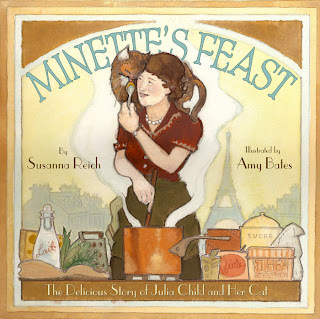 I was thrilled when the blog, A Tonk's Tail offered a give-away of Minette's Feast: The Delicious Story of Julia Child and Her Cat. As you can probably tell, I won the book! The illustrations in the book are particularly delightful. They were created using pencil and watercolor and the effect is simply beautiful. I was amazed at how skillfully and spot-on illustrator Amy Bates captured Julia's expression and posture! Author Susanna Reich loved watching The French Chef as a child. She was "entranced by Julia's energy, sense of humor and unapologetic enthusiasm for cooking and eating." as so many of us were. Reich had the honor of meeting Julia in 1993 when she designed the floral decorations as well as Julia's official birthday present for her 80th birthday party. Some years later, when Reich began writing children's books Julia "lurked in the back of her mind as someone she would like to write about." After reading Julia's memoir, My Life In France and discovering that Julia had a cat named Minette, that became the inspiration for this wonderful book. Minette tells what it is like to smell and taste the many culinary delights that came from Julia's kitchen and describes them in a way that will be intriguing to children and adults alike. It brings back to life in a most unique and charming way the iconic Julia Child and introduces her to a new generation of "foodies." and if the world of cooking hadn't had Julia Child, it would have been equally as dark. If you have children or not, if you love cats, all things French, culinary and Julia Child, pick up this delightfully written and lovingly illustrated book, it is certain to satisfy! I loved the book too! It was so awesome to discover that Julia Child loved cats! I know! I never knew that either! I always loved watching Julia Child's cooking show. This sounds like a delightful book. I did too and the book is! The Galloping Gourmet with Graham Kerr! gosh that is a blast from the past. Have a super Saturday. Yep Molly, it shows that I am older than dirt! yep me too! Thank you!!!! I love the book, too - and of course, I love that Julia Child's first cat was a tortie! Great review. A tortie of course!! Thanks so much Ingrid! That does sound like a great book. A two fer. A cat and a cook. Great review. Made me want to read it. Thanks so much Marg! Love how you said "two fer" "A cat and a cook" you got it!! Hi Lee and Phod! Loving animals is all that matters! I have a particular love for Julia Child. When growing up, I had a somewhat rough childhood and our step-father did not allow my brother and my step-brothers and sisters to watch TV at all. The only show we were allowed to watch was the French Chef and I was fascinated with the quirky, honest, and lively personality of Julia Child. I loved the movie about her and this book sounds like a "must have" for me. Cooking and Cats... doesn't get much better! Ohhh Deb you will love this! Mind you, it is a children's book but you will deeply appreciate it, I know it! Love how you said " quirky, honest, and lively personality" soooo true! Sounds very interesting! Great review. Nice review! It sounds like a really pawsome book! I would imagine that for a feline foodie, being able to live with Julia Child would be like winning the cat lottery!! MOL. Wishing you an abundance of happiness, laughter, joy and blessings for the New Year! lol Julia you are right! Thanks about the review too and I wish you the same for the New Year! Oh! I have got to get this book! I love cookbooks (and cooking) and I have quite the collection of cookbooks as well! thank you so much Nellie! You will love it! It is a children's book but is definitely worth it! What a beautiful book! Pleased to know Julia Child loved cats as well as cooking. yep it was great to know! Sound like something right up the lady's alley. She has quite a collection of cookbooks. She got rid of about half them a few months ago (donated), and now the bookshelf is almost filled again. Ohhh Mr.Black your lady and my mom would get along quite well. My Mom collects cookbooks and has a TON! Cooking magazines too! We loved this little book too! thanks so much Texas! glad you were able to read the book! Cute book. I didn't know that the movie Julie and Julia awoke your interest to start this blog. Nice to know. yep and to overcome depression from having been one of 14 laid off from a newspaper job in Michigan. We were let go due to downsizing. But Julie & Julia was the catalyst. I said "I can do that"
We had no idea Julia Child had a cat! Will have to add this to our reading list. Can't wait to "devour" it. Christine I didn't find out til a few months ago myself! Love your use of "devour" it! I didn't know Julia Child had a cat! I love the title and illustration on the cover. Sounds like a sweet read and I will definitely check it out. Thanks so much for your continued support and warm wishes for Pip. We are taking things day by day ...he has good days and not so good days. Mr.Pip nor did I til some months ago. The illustrations are just wonderful! You will love them! Thank you for the review. Somehow knowing that she had cats makes Julia Child more human for me. Purrrrrrrrrrrrrrs.